All I have to say is “chewy, sink your teeth into chocolate chip cookie” and I’ve gotcha, right? The Cookie Swap Season has officially begun, and today I’m starting with the Granddaddy of the Holiday Cookie Exchange – rich and chewy homemade chocolate chips. This recipe, from Wendy Putler, is one of the best we’ve ever rescued, made with whole wheat and real butter. Here’s Wendy’s story and her scrumptious step-by-step creation. Wendy, put me on the “friends” list, and thank you for the recipe! Mix the first 4 ingredients together. Cream the butter and both sugars, adding gradually. When sugar is dissolved, add eggs one at a time. Add vanilla and finish mixing. Add the dry ingredients. After the dough is mixed, stir in oats, walnuts, and chocolate chips. Bake at 375ºF for about 8–10 minutes. They will turn out thinner than I like and a little crisp at the edges. They are still delicious, but the best way is to scoop all the dough into round balls and then freeze. Bake them at 375ºF directly from the freezer for 9–11 minutes. They turn out thicker and chewier. This makes a HUGE batch because I freeze them. It works fine if you half the recipe. I usually make a double batch and then, using a cookie scoop, make dozens of cookie balls, which I freeze individually and then seal by the dozen or two in a freezer bag. 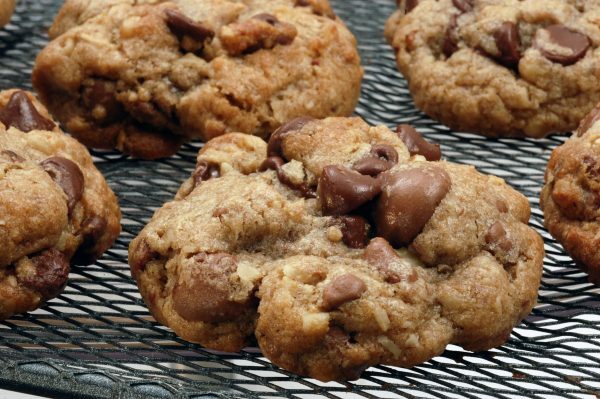 My kids – and husband – can pop some frozen cookie balls in the toaster oven and in a few minutes have freshly baked cookies!